Surprise the whole table when you bring out this Coconut Macaroon Shortcake after dinner. 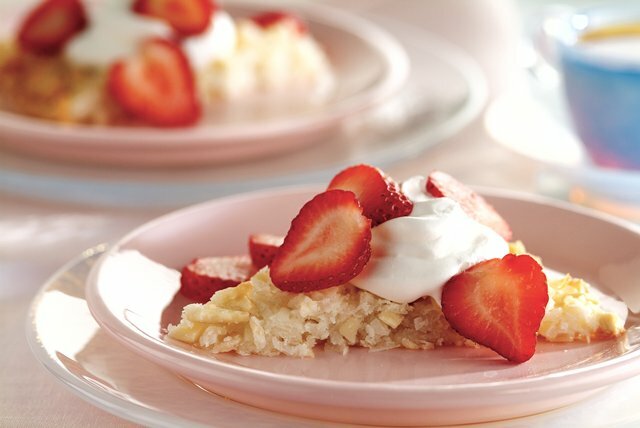 Strawberry shortcake gets a makeover by adding coconut and almonds to the batter when you try this Coconut Macaroon Shortcake recipe. Combine coconut, nuts, sugar, flour and salt in large bowl. Beat egg whites and almond extract lightly with fork until blended. Add to coconut mixture; mix well. Trace 9-inch circle on foil-covered baking sheet sprayed with cooking spray. Spread coconut mixture evenly onto foil, staying within circle line on foil. Bake 15 to 20 min. or until lightly browned. Cool completely. Remove shortcake from foil. Serve topped with COOL WHIP and strawberries. Shortcake is the perfect choice for a special occasion. Plan ahead and eat accordingly before indulging in a slice of this luscious dessert. Once thawed, refrigerate COOL WHIP Whipped Topping for up to 2 weeks or re-freeze.